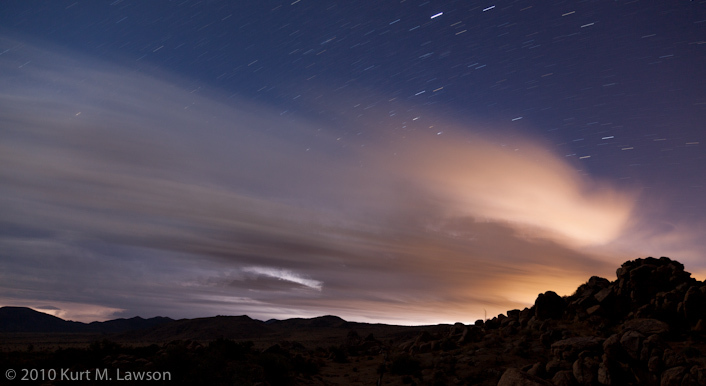 I have now visited Joshua Tree National Park twice. 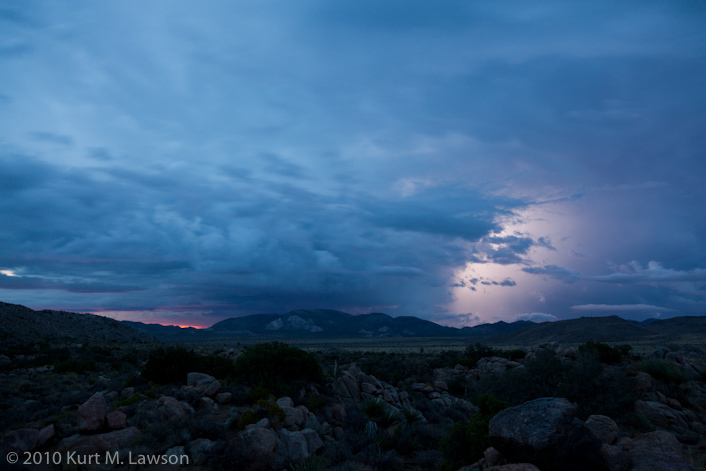 Contrary to what one might expect from the desert, both visits (February and October) have involved rain and lightning. I just yesterday returned from this second trip to Joshua Tree, and ahead of the other pictures I thought these deserved their own post. I have always wanted to shoot lightning pictures. I have never had the opportunity to do so from a safe distance. As luck would have it, yesterday morning afforded me the opportunity I had long waited for. I was on a backpacking trip to summit Quail Mountain, the highest peak in the Little San Bernardino Mountains. Starting around 4am, a huge light show played out to our east. I just had my 5D Mark II, 24-105mm lens and a tiny Gorillapod Focus (with the ballhead X). 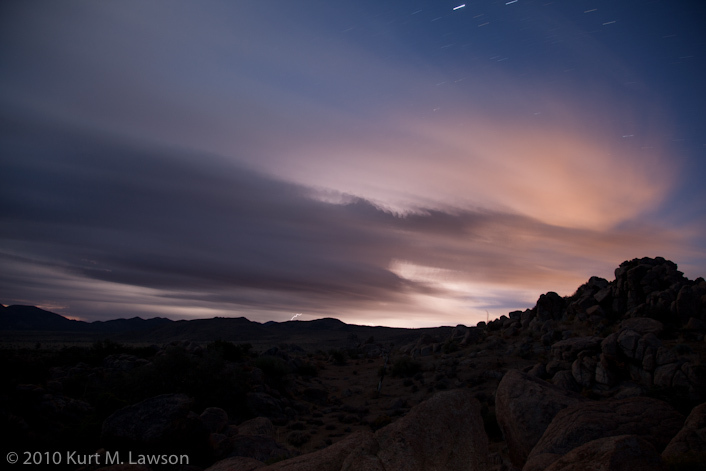 A rock outcrop provided a high platform for this setup so I could get a good view of the action from camp. I kept the camera close enough that I could keep an eye on it from my tent, and run out and fetch it if it started to rain, which it did twice. Wow! That’s what I thought when this exposure finished. I decided that I would pretty much spend the rest of the morning taking pictures instead of sleeping. Who needs sleep when you’ve got this going on? As the storm moved north it got closer to us. The lightning became more and more visible. The storm was so electrically active that there was almost a strike or cloud to cloud bolt every second, with a faint distant roar of thunder. It was really quite a show. Here the sun was beginning to rise on the distant horizon. The horizon was 99% blocked by the storm except for a brief time where I could see a little red on the left. In this last one the lightning almost seems to wrap around a cylinder of rain. All in all I’m ecstatic about my first ever lightning pictures. What an amazing trip this was! Finally, here is a star trail picture I took earlier in the evening when the skies were clear. Which lightning picture is your favorite? Let me know in the comments please! Sally O'Brien - 6 is my favorite. GORGEOUS. Anthony - Love the star trails. I think lightning 3 & 7 are my favs. Kristen - These are AWESOME, Kurt. It’s hard to choose between the lightning pictures — maybe 1 or 6? The very first picture is my favorite of the whole bunch, though.